This post first appeared in 2007. I’ve updated and republished it with today’s date. I’ve also made a new page for all my Passover posts. Enjoy! Around this time of year, you’ll see reprints of articles about how dirt isn’t chametz and how you can prepare your house for Pesach in just a few hours. The authors usually go on to say that you should be spending the weeks before the holiday on outings with your children, who are on vacation. These rabbis are well-meaning, but they misunderstand the reality of most observant Jewish households. What makes Pesach difficult isn’t just having to scrub the stove or clean the refrigerator. You are planning for the most important and elaborate meal of the year, while making your house kosher for Pesach and having your small children underfoot. You can’t just do a regular grocery shopping—you need to fight crowds and shlep home enough to restock your entire kitchen. Everyone needs new clothes and shoes at the same time. You have to plan where guests will sleep, supervise the kids’ cleaning or do it yourself, and make sure you have enough Pesach pots. (I’m convinced that mine shrink every year.) We’re lucky if we have a chance to make plans for chol hamoed–the intermediate vacation days of the holiday. Doctor, dentist and optometrist visits inevitably find their way into the mix, as do weddings and bar mitzvahs. Appliances always seem to break around this time of year. When you take out the Pesach utensils at least one thing is missing or unusable, requiring yet another visit to the store. Older children can help but they also need rides and other types of attention. Younger children need supervision, cuddling and stories. And if you postpone important tasks they won’t happen until after Passover, when it could be too late. And let’s not forget the meals. Unless you have a budget and source for take-out food, or nearby family going away for the holiday, you still need to feed your kids. Heck, providing meals for my family is practically a full-time job even when I’m not making Pesach. I’m thinking of starting a competition for families to see who can use up the most leftover chametz without being reduced to bread and peanut butter. I still haven’t figured out how to make Shabbat Hagadol, since the seder is on Monday night. Should I cook double in advance and eat reheated food, or turn over the kitchen early and make the food kosher for Passover? Or cook as usual, but very simply? Once I make a decision I’ll work out the details but the logistics of figuring out when to put which dishes where are complicated enough to make anyone crazy. Fortunately my inner pre–Pesach mechanism will kick in, as it tells me what tasks to do when. For instance, when I take out the Pesach dishes I automatically make hard-boiled eggs and fresh mayonnaise (no running between stores to get that last elusive jar). After lunch before the seder I grate horseradish and make charoset. Don’t worry if you are new at this. Your inner Pre-Pesach Mechanism takes time to mature. Read more Passover recipes and tips at Cooking Manager. I’ve updated a page with Passover posts from A Mother in Israel. You hit the nail right on the head for the challenges of Pesach preparation. At least this year I got the clothes buying part out of the way earlier due to the bar mitzvah this past weekend. But I didn’t even want to think about all the shopping, cleaning, etc. that awaits until I was over that hurdle. Usually I buy over several week rather than plunking down $500 or more in one shopping spree. My head is spinning reading your posts and I don’t even have to make Pesach this year. But a lot has come up in the past few weeks and I’m booked with clients. So, I’m really starting to sweat. The 5th question should be: Why does April 15 need to coincide with Pesach? (continued) Or nearly coincide with Pesach, as is the case this year. I’d love to hear about how you organize your Pesach cooking and cleaning schedules. SL–what about extensions? Overseas filers get automatic extensions to June 15. My husband’s busy time at work also usually coincides with Pesach as well. Ariella, we also made a BM just before Pesach.Hope you got some leftovers at least. Extentions are great. But you need to be paid up or you will be hit with interest and penalties. For those withholding at the correct rate there shouldn’t be an issue. Those who are behind on making payments would be wise to send in a check to the IRS and hope for the best. Ariella-LOL. 17th, 15th. . . I just hope my clients stop pushing off their appointments because I plan to enjoy Pesach. Yep. The day of the seder is multi-tasking to the nth degree. And then there’s every day’s lunch and breakfast…. Anon-I hear you. My kids went through a loaf and a half of bread today for lunch. Small correction: Rav Aviner’s plan for Pesah cleaning, not preparation, “only” cleaning the house is a 24 hour plan. We had to hire help one year to do virtually EVERYTHING. The young woman was great. We discovered that it took 36 cleaning hours, intense cleaning, to clean our 144 sq. meter five bedroom house. But with so much else to do, kids’ stuff, laundry, shopping, cooking, work outside of the house, etc. it is hard to work the cleaning time into an already full schedule. 36 is nine times more than 4. I think it depends upon little children and how closely you chase after them during the year. If you have a couple of mobile ones under 4 and actually do anything other than run after them during all waking hours (like cook dinner, fold laundry, put your feet up) you really can’t assume too much. Perhaps Rav Aviner’s “4 hour cleaning schedule” means you don’t actually clean any of those places but instead rely upon the bedika? But that’s why we check most rooms before leil bedika – because if you really check each of those vulnerable rooms like you’re supposed to, you’ll be up all night. With the Pesach dishes we have Pesach toys, just one or two big things, since they haven’t been used for 1 year the kids feel they are new, and, honestly, one set of toys is more than enough. Since we started doing this my life is so much easier before pesach. Oh my, you said the P word. so what will we eat shabbat hagadol??? Also, why waste valuable cleaning time cooking (on that Friday) ????? A comment on “You can’t just do a regular grocery shoppingâ€”you need to fight crowds and shlep home enough to restock your entire kitchen.” – you also have to take your time when shopping to check hechsherim – (I have seen real chametz in pesach eisles in the States, and here in Israel, you have to read the fine print on everything you buy to see that it is not kitniyot – if applicable). You don’t just grab your usual bottle of ketchup – it takes at least double the amount of time. Unlike most people, I don’t make a big meal for the Seder (neither do I for Shabbat). Especially after eating all the matza and egg/salt-water people aren’t very hungry. I serve soup, chicken and salad. Also my shopping isn’t that different from during the year. Since living on a reduced budget I don’t buy that many ready-made foods and cook from basics. motherof4, my menu sounds just like yours. But shopping is still a huge job. Matzah and potatoes require shlepping. yes but they don’t require intense hashgacha checking. karyn–I’ve trained mine to lower their expectations. My shul is having meals for Shabbat HaGadol, but it’s very expensive, so we will eat our regular meals for Shabbat HaGadol. Then Motzei Shabbat I will kasher the oven and stove (as I’ve always done in the past), and start cooking on Sunday. Sun and Mon will be crazy, but hey, it’s only once a year…But also pre-pesach we buy kitniyot items for snacks and the like, so that also helps with the cleanup. Then again, my wife said yesterday that she finished the major cleaning for Pesach. (that was until the kids got to it again…:-) ). aaa, that is what I invariably end up doing. It is crazy though! Have we gotten any update from the dear reader who was pregnant and due during Pesach? How is she coping? I am only at 31 weeks and already slowing down…a lot…sooooooo tired at night. And my mother is coming to visit this weekend….and we are attending a (non-Jewish) wedding out of state the weekend before Pesach. So I have to finish my taxes AND my Pesach prep by April 14. Going to be a tough three weeks. Well I’m one of them…. Someone recently posted to that thread that she’s done what I had hoped to – her bedrooms are all done. Today I was supposed to polish off the children’s bedrooms and go through the girls’ clothing with them – but (groan) I took a nap. I booked girls’ haircuts for the end of next week. Booked a cleaning crew for double dates with the ok of the organizer that I’d cancel one. In process of booking pre-Pesach camp for preschooler. Next week is for cleaning out the car, finishing menus and creating shopping lists, finishing all bedrooms (we have 4), pre-cleaning the fridge and freezer (if my cleaner comes – she’s not been so consistent recently). I’m aiming to be KFP for Shabbat HaGadol. I count my blessings that our home isn’t especially large, and we have some resources for hiring extra help. And Shira/Hipstermom had a girl, Nathalie had a boy. Yeah… and I though the bedrooms would be ready before the birth,.. But between being exhausted and hospitalized before birth, I didn’t get to it. Rigt now, I’m dealing with post c-s pains (baby was born on purim), and traveling back and forward to NICU…oh- and taking care of the kids at home (thank G-d for neighbors for the ready made meals and other help…). Pesach will be done- there is n way I’m closing the house for a week.. I just will not do everything as much in depth as usual, and might sell more than usual. For the time being, I’m just trying to ignore that fact that rosh hodesh is next week, and that we will still have a brit to organize! I remember reading this article when you wrote it originally. It stayed in my mind because you expressed the difficulties so well. How it’s not just about the cleaniing – it’s about keeping your family fed and their clothes laundered to a reasonable level, as well as the shopping, which is at least twice as time consuming as regular shopping. Thank you again for your clear headed and elequoently expressed insights. 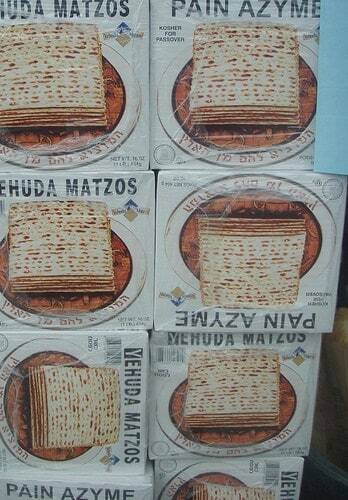 This year I am way behind in my Pesach preparations. I have usually gotten a start on the bedrooms before Purim or just after, but this year I haven’t even started yet. I have been caught up babysitting for my son’s children, while his wife produced another one :-). Plus our group’s Purim project (database run by muggins here) and just plain old getting older. I’ve reduced my Pesach cleaning to the minimum over the years. I concentrate on the kitchen and living room. Husband and sons clean the bookcases or no one does. I give the toys a once over, cleaning out the toy box itself, because that’s where hidden cookies or half-eaten sandwiches are discovered. I told my cleaner if she wants to clean the windows (she does) she’s welcome, but I have no intention of bothering right at the beginning of Hamsin season. It’s a bracha levatala (wasted effort) in my opinion. I have solved the problem of Shabbat Hagadol by going to my daughter. In return she is coming to me with all 5 children for Seder (her husband is an army Rav and will be making Seder there). Sounds like fun, Annie. I invited a family with two small kids for Shabbat the week before Pesach. What was I thinking LOL? But I told the kids their room has to be ready by then so the guests can sleep there. Regular life is the real challenge. Pesach is just on top of that. I have two major tasks completed, so at least that. That’s a good line, Orthonomics. Summed up what I wanted to say. I hate the whole pesach thing and since I live in London Ike life easier by coming to Israel where my husbands relatives live. My main frustration is the lack of choice here of food to eat – sorry food my chidlren will eat. At least in Israel they can eat pizza, pasta – of sorts, and plenty of icecream. Happy Passover! Naomi, the real question is whether you make a second seder? Ok, now I am really hyperventilating! I always lived with the dust is not chametz credo until my mother started coming from the states for Peseach a few years ago. Now in addition to Pesach cleaning (not spring cleaning!) I have to do “mother cleaning,” which is even harder than the other two! And she comes a week before Peseach and has to be entertained – separately from the kids. But we seem to manage every year, TG! Marcy, well, at least you’ll have a clean house. The joys of aliyah. I found a good few years ago that spending some time with my computer reduced some of the pre-Pesach craziness. In the files I keep cleaning lists room by room, menus, shopping lists and a fully annotated calendar with what to do when on it, including all the extras mentioned by many commenters. I allow some blank spots on the calendar for those unexpected but sure to show up things. Over the years I’ve fine tuned that calendar, moving some items as far back as January or February (no, bedroom curtains don’t have to be part of those last hectic weeks). The fact that the lists are there and that I know they have worked for me before let’s me relax just a bit. Because I have those files going back enough years, I know exactly what I did the last time that Pesach came out the way it comes out this year, including what was cooked for Shabbos HaGadol, when the kitchen was turned etc.. I let past experience be the guide. thank you for writing this… i feel much better now knowing how others feel. we don’t have little children running around… just lots of hungry teenagers. How on earth did we do this as young parents?